So you have decided you want to buy a wine aerator but you are wondering which is best? 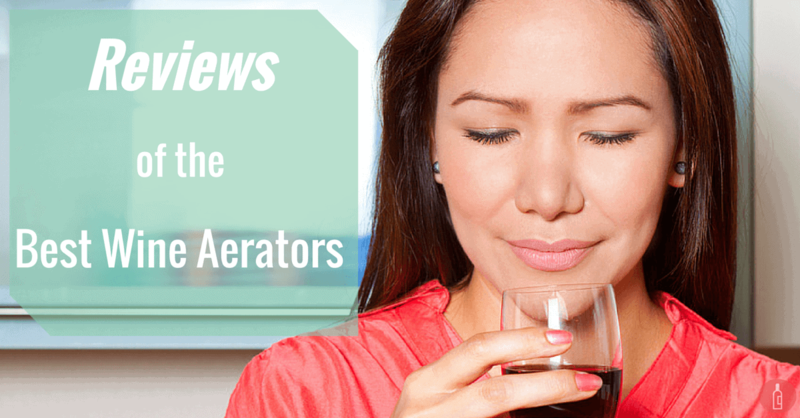 There are so many on the market these days that it can at times be difficult to make a decision - that's why I have put together this list of wine aerator reviews to make the choice easier for you. To save you time reading through the entire article, we'll just list the top 3 aerators of 2019 right here so that you can click on them to find out more. Before we jump into the details, have a look at the summary table of the top 3 wine aerators​ below or keep scrolling for a more detailed review of each below. Below you will find a list of the 3 best wine aerators, each of which will be reviewed in greater detail below. Top in terms of flavor and aroma. Small & sturdy enough so that it won't break. Well-renowned brand when it comes to wine aerators. Sturdy and oval design makes it one of the most reliable aerators. Spills & creates a mess. 5-ring rubber gasket - Fits almost any bottle. The design looks great and unique. ​ Great gift for Weddings, birthdays or any occasion. Effect on aerating wine under-performs compared to other brands. As I alluded to earlier, before I started getting into wine I used to always be a little bit skeptical when people spoke about "letting wine breathe", or "using a wine aerator" prior to drinking the wine. I would generally never have the patience for it. I'd basically want to drink the wine as soon as I poured it into the glass and for me "letting the wine breathe" was something that only wine snobs were concerned about. However, over the years, and as I've started to get more into wine, I have started to see the benefit of letting wines breathe. It can really make a huge difference in the overall experience of the wine that you're drinking. In fact, the difference can be so great at times, that you'd think you're drinking an entirely bottle of wine. The concept of "aerating wine" or "letting wine breathe" is simply the process of maximizing the wine's exposure to the surrounding air, thereby oxidizing your wine. So why should you aerate or let your wines breathe? For more information on the importance of letting your wines breathe, please see the video below. Why Use an Aerator Instead of a Traditional Decanter? So now that we know why it's important to let our wines breathe before we drink them, let's look at a couple of ways we can achieve this. The traditional way would be to pour your bottle into a decanter, and let your wine sit there for around 30 minutes. This ensures that there is ample time for your wine to get exposed to air particles, so that the wine opens up and is able to reach it's full potential. This is certainly how I used to let my wines breathe before I ever owned a wine aerator. There are two main disadvantages of aerating your wine through the use of a traditional decanter. You run the risk of having to throw your wine away since you'll most likely pour the entire bottle into a decanter and may not end up finishing all. The above to reasons is why I eventually switched over from a traditional decanter to a wine aerator. Moreover, besides overcoming the above drawbacks, the best wine aerators have a number of other benefits. They aerate instantly. As soon as the wine has passed through the aerator, it is ready for consumption. What Types of Wine Aerators Are There? Ever since wine aerators started to get popular within the realm of wine accessories, countless number of designs have hit the market, each with their own advantages and disadvantages. Having said that, three of them probably the most common. The aerator pourer is a type of aerator that you attache straight to the bottle and aeration takes place as soon as you pour yourself a glass. This is my favorite type of aerator, as it creates the least amount of mess and has the same amount of impact in terms of aerating your wine. The Vintorio Wine Aerator that I have ranked #1 in the table above is an aerator of this type, and is in my opinion the best of its kind. No mess. Since the aerator generally attaches directly onto the bottle you won't have issues with spillage. Lightweight. These types of aerators are typically smaller and very light-weight. This allows you to take them with you wherever you go, and prevents them from taking up too much space. Some designs aren't as effective. A number of pouring aerators aren't as effective in aerating your wine. Keep an eye out for the ones that don't show "bubbles" in the wine, since these devices are simply pourers but won't do actually help aerate your wine. Can be more fragile. Some designs can be more fragile and can therefore crack, or break when they are put under too much stress. This is probably the most common type of aerator you will find. It's the one that was made famous by Vinturi, and since then a whole host of other manufacturers have tried to follow their footsteps. I've tried a number of others, but in my opinion the Vinturi is still best. 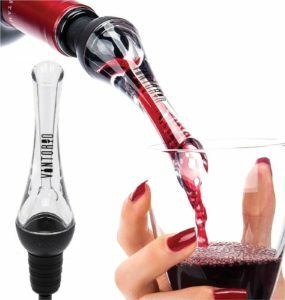 You simply hold the aerator above your wine glass, and pour the wine into the aerator. As the wine passes through the aerator, the wine gets oxygenated and then pours into your glass. Extremely sturdy. These types of aerators are generally the strongest. They are usually made of thick acrylic and come in an oval shape that is unlikely to break during use. Great gift. In my opinion, these are probably the most aesthetically pleasing out of the three main types of aerators. As a result, they make a great gift for weddings, birthdays, or any other type of occasion. Extremely messy. Unfortunately these types of aerators are just plain messy. They don't attach to the bottle. Instead you hold them above your glass as you pour the wine through it. This leaves a lot of scope for error and splashing, and therefore often results in a mess. Inconsistent quality. I'm not sure what it is, but a number of customers have experienced inconsistent quality with these types of models and find that it doesn't work as well with all wines. This type of aerator is the newest of the three. This type of aerator attaches directly to the bottle, after which the wine passes through an oval shaped dome before it pours into the glass. The oval shaped dome ensures that the surface area of the wine increases which results in more exposure of the wine to the air. The first company to come up with this design was Soiree, although a number of other suppliers have since entered the market as well. Looks fancy. These types of aerators look the most fancy, and therefore make a pretty cool gift. Very fragile. As you can imagine, this type of aerator is rather fragile. The design itself means that any sort of pressure on the device will result in cracking. It is not recommended to travel with this type of aerator. Awkward to use. With these types of aerators, you have to hold the bottle completely upside down in order for it to function properly. This can feel rather awkward, not to mention that you run the risk of the aerator coming undone and the wine spilling all over the counter. Before pulling the trigger and purchasing a wine aerator, I'd recommend that you take the following factors into account before you make your final decision. The best wine aerator might mean one thing for one person, but something completely different to the other. What's your budget? How much money are you willing to spend on an aerator? Most aerators are pretty affordable these days and will come with a price tag of around $20, but there are also a number of more expensive variants available on the market (this does not mean, however, that they perform better). It's important that you choose a budget that you're comfortable with, however, bear in mind that at the end of the day the right wine aerator should actually help you save money by making cheaper wine taste better. Are you buying it for yourself or as a gift? If you are buying an aerator for yourself you might want to go for something that is more functional and doesn't have all the bells & whistles. On the other hand, if you're buying a gift for someone, you might want to go for an aerator that is both functional but also has nice packaging included. Are you going to travel with it, or will you keep it at home? If you're intending to travel with your aerator, or you want to take it elsewhere, you might want to go for one that is more sturdy. Putting your aerator in your suitcase lends it to potentially breaking, so the more sturdy your aerator, the better. Warranties and guarantees. Last but not least, you'll want to weigh up the guarantees that the various suppliers of wine aerators are giving. The last thing you want to happen is for your wine aerator to not be exactly what you wanted, and not being able to return it. Thankfully most aerators will offer at least a 30-day money back guarantee, but a number of them offer a Lifetime 100% Satisfaction guarantee. I would keep an eye out for those so that you can be sure that if there's ever an issue, you'll be able to get your money back in full. Below you will find more detailed reviews of each of the top 3 wine aerators that I selected earlier. As I mentioned before, this is by far my favorite wine aerator. The Vintorio is a fairly new device, and was released in April of 2015, but it seems to be selling extremely well. I ran a blind test on three wines with it myself, and it was overwhelmingly obvious that the wines that passed through the Vintorio tasted remarkably better than those that hadn't. Furthermore it comes with great packaging, which makes it a great gift, and an added bottle stopper which allows you to seal off your wine if you haven't finished everything in one go. Double air intake system. This system ensures maximum exposure to oxygen ensuring that your wine is fully aerated as it enters the glass. Removable splash guard. The aerator contains a splash guard that ensures there is no mess when pouring wine, which can be removed before cleaning. 100% dishwasher safe. Unlike other aerators, the Vintorio can be washed in the dishwasher making it easy and convenient to clean. The best thing about the Vintorio is probably that it does what it is meant to do - aerate your wine. In a number of tests that I have done between aerators, the wine aerated by the Vintorio constantly comes out on top in terms of flavor and aroma. Secondly, it also makes a great gift. It has some of the nicest packaging (a magnetic buckle box) out there, comes with detailed instructions on how to use it, and comes with a Lifetime 100% Satisfaction Guarantee. If that doesn't show confidence on behalf of the suppliers, I don't know what will. Lastly, it's small enough for you to take with you on your travels or elsewhere and is sturdy enough so that it won't break. I can't recall how many times I've taken this with me while camping, going to picnics, or when grilling with our neighbors. Although this is by far the best wine aerator on the market today, there is one little thing that I would improve - it does not come with a stand. Once your done using the aerator, you'll either want to put it straight into the dishwasher, or rinse it under the tap, otherwise you'll run the risk of wine stains. Although not a big deal, a wine stand would have been a nice added feature, but at the same time would have made the whole package more bulky. It looks like not including a stand is a trade-off that the suppliers have consciously made and probably for good reason. If you're looking to go for the more traditional type of wine aerator, the Vinturi is definitely the model you want to go for. It was the first of it's kind when it came to the wine aerator as we know it, and although a number of competitors have since tried to imitate this model, the Vinturi is still by far the best. It's the biggest name out there for wine aerators, and the model also comes with a little travel pouch which is handy if you're on-the-go or if you intend to take the aerator elsewhere. Available in multiple colors. The Vinturi is available in multiple colors and sizes, making it likely that you will find the option that suits you. Comes with no-drip stand. The aerator comes with a no-drip stand in which you can place the aerator before you pour the wine. Patent-pending design. Although there are a number of copy-cats that have tried to copy Vinturi's design, they currently have a patent pending on their design. 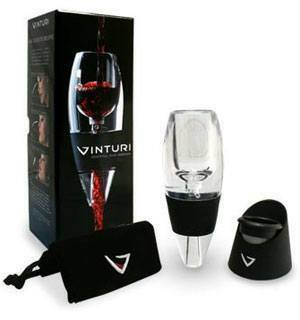 The Vinturi is probably the most well-renowned brand when it comes to wine aerators, and this is not without reason. They were probably the first to develop this type of wine aerator, and it is one that does the job very satisfactorily. The main problem I have with this aerator is that it tends to create a mess when you use it. Instead of it attaching directly to the bottle, you have to hold it above your wine glass as you pour wine through the aerator. More often than not, this results in some wine splashing elsewhere. Unfortunately, this is something that isn't a quick fix, but rather has to do with the design of the aerator. 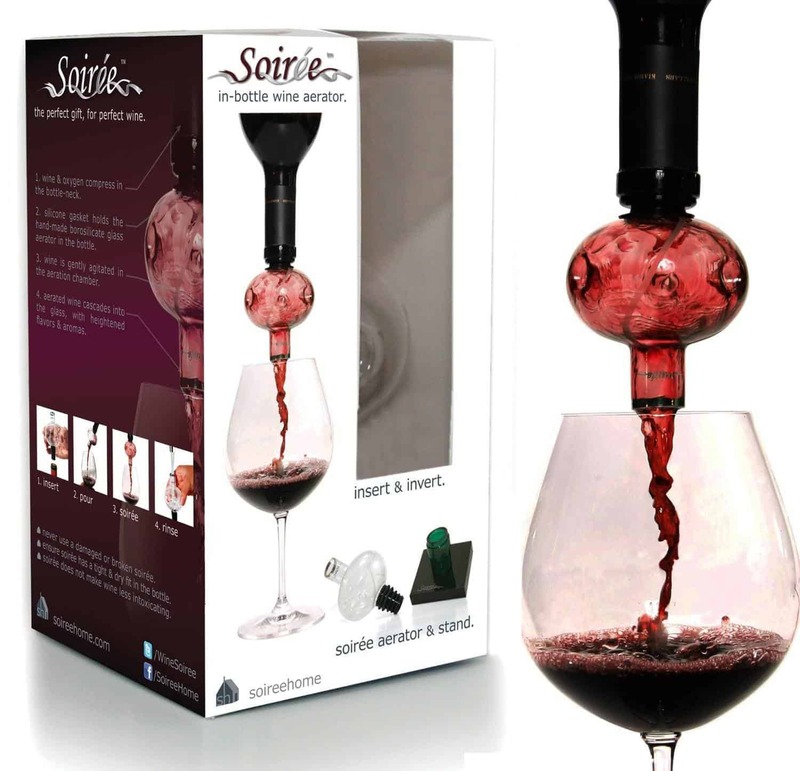 The Soiree is a great choice if your looking for an aerator that is a bit more unique than the Vintorio or Vinturi. The oval shaped acrylic aerator will certainly raise some eyebrows when you put it to use, and people will naturally ask questions since it's not immediately apparent that the Soiree is an aerator. At the same time, the Soiree probably looks the most fancy, so if this is the type of reaction you are going after, then I would recommend the Soiree. 5-ring gasket. The Soiree Wine Aerator includes a 5-ring rubber gasket that will fit in almost any bottle. Includes drying rack & stand. The aerator comes with a drying rack and stand, which is a great place to put the aerator after you have used it. The design of the Soiree Wine Aerator is one of the more unique ones around. It just looks great. As a result, it makes for a great gift for weddings, birthdays, oany other occasion. It also tends to raise eyebrows when you use it. As a result of its unique design, people often wonder what it is, making it a cool gadget to own. What the Soiree has in looks, it lacks in functionality. Not only is the aerator rather fragile, some customers have also complained that it's effect on aerating wine under-performs versus some of the other brands out there. If you're looking for more of a gimmicky aerator, I would recommend the Soiree. If not, I would recommend either of the two aerators that I recommended above.